Ever since I was little, I have asked many people the question, “What is the key to success?” Some of the responses have been hard work, ethics, integrity, persistence, etc. When I was in college, I realized another key to success that seemed to be hidden in the many responses I received. That key is feedback. How do you know you are doing a good job? Feedback. How do you know when you are doing a bad job? Feedback. How do you know if you are in danger? Feedback. You get the picture. Feedback is the key to growth in life. Although feedback can be hard to receive at times, it is essential to bettering ourselves and improving as leaders. Recently, I was speaking to a well respected friend of mine. I asked what she did to reach her high level of success as an executive within a large corporation. She said that the game changer for her career happened when she began actively asking for feedback. She began asking for feedback from all sources. Each of these groups will give you unique feedback that the other groups will not be able to give. As you seek feedback and actively try to follow it, you will grow in ways you never before thought possible. As part of that growth, you will have to overcome weaknesses that you didn’t realize you had. It will be a challenge at times, but you will be much better off in the long-run. I encourage everyone to seek feedback regularly. 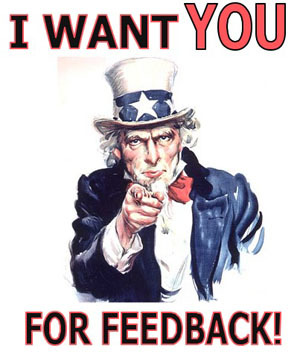 What benefits in your career growth have you seen from feedback?